Paul Domalakes, Esq--Master of Ceremonies for Lithuanian Days, Andrew Szczyglak --Mayor of Shenandoah, Neal Goodman--PA House of Representatives, Theresa Ruotolo--Army Captain-PA National Guard, Dorothy Setcavage & James Setcavage--St. George Parish Historians, William V. Lewis--PHMC, Rhonda Farber--Air Force Master Sgt-PA National Guard. Click on the image for a larger version of this picture. It will open in it's own window. Zygimantas Pavilionis--Lithuanian Ambassador to USA, Carol Luschas--Public Relations for The Knights of Lithuania, John E. Domalakes--Schuylkill County Judge, George F. Halcovage,Jr--Schuylkill County Commissioner. 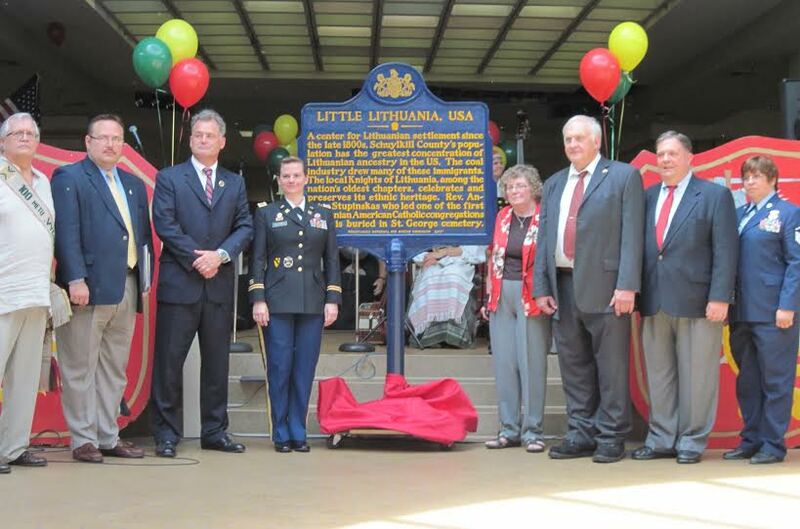 FRACKVILLE - The 99th annual Lithuanian Days celebration at the Schuylkill Mall on Saturday had a special event with the unveiling of the "Little Lithuania, USA" state historical marker during the opening ceremonies. James and Dorothy Setcavage, members of the Knights of Lithuania Anthracite Council No. 144, which sponsors Lithuanian Days, learned in April that the state Historical and Museum Commission had approved the application submitted to recognize that Schuylkill County has the highest percentage of residents with Lithuanian ancestry in the United States, and that Shenandoah has the highest percentage within the county. The Setcavages provided most of the research for the marker application. Knights Secretary Paul Domalakes offered the traditional welcome to the crowd. He noted the 20th anniversary of the partnership between the Lithuanian military and the Pennsylvania National Guard, a partnership that has been beneficial to both countries. The longest consecutive ethnic celebration in America, Lithuanian Days began with music by The Sensations, followed by the opening ceremonies, which included a color guard composed of members of the Pennsylvania National Guard and the Lithuanian Partisans Living History Group. The ceremonies included the singing of the U.S. and Lithuanian national anthems, a recognition of this year's 100th anniversary of the national Knights of Lithuania organization and a prayer offered by the Rev. Robert Finlan, pastor of St. Joseph the Worker Parish in Frackville. The historical marker was covered near the stage, mounted on a pole on a wheeled dolly. PHMC board member William V. Lewis was the representative from the state agency on hand for the unveiling. Two members of the Pa. National Guard, Army Capt. Teresa Ruotolo and Air Force Master Sgt. Ronda Fawber, wheeled the marker to the stage steps for unveiling. Ruotolo and Fawber are the coordinators of the State Partnership Program. "I have to tell you that I have done quite a number of these over the last couple of years, but this is the first time that I have ever done a marker unveiling in a mall," Lewis said. "We' re usually on the side of the road or another place. I know that this marker will find a wonderful place in Shenandoah, where it will be enjoyed for many years to come. 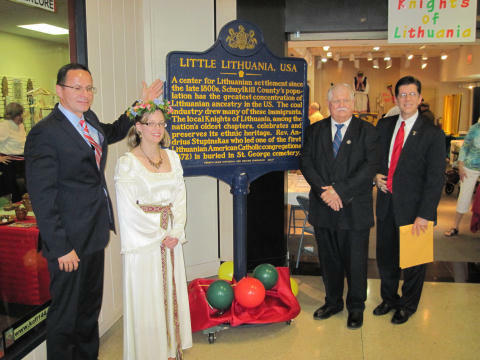 This is the Commonwealth&# 39;s permanent recognition of the great contributions of the Lithuanian community here in Schuylkill County and across our state to our heritage." Lewis added, "I think the most interesting thing is that this is not only an historical marker, this is an educational piece. Every one of these markers is on the state website with background educational information for children who want to learn more about these. They are all GPS located." 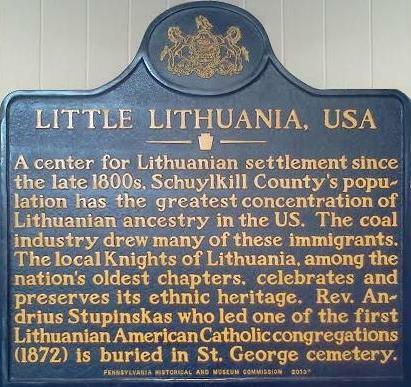 "A center for Lithuanian settlement since the late 1800s, Schuylkill County's population has the greatest concentration of Lithuanian ancestry in the US. The coal industry drew many of these immigrants. The local Knights of Lithuania, among the nation's oldest chapters, celebrates and preserves its ethnic heritage. Rev. Andrius Strupinskas, who led one of the first Lithuanian American Catholic congregations (1872), is buried in St. George cemetery." 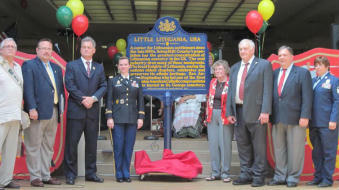 "Pennsylvania Historical and Museum Commission 2013"
According to James Setcavage, the marker will be transported to Shenandoah and is expected to be installed within two weeks near Main and Centre streets next to The Dorsey Brothers state historical marker. He said the marker will be placed without any further ceremony. Speaking to the audience was state Rep. Neal P. Goodman, D-123, who presented a citation from the state House of Representatives and Shenandoah Mayor Andrew Szczyglak, who proclaimed Aug. 10, 2013, as "Lithuanian Day in the Borough of Shenandoah." "We are honored to have such a beautiful memorial to dedicate to such wonderful people," Szczyglak said. In addition to the marker unveiling, Army Col. Mark O'Hanlon, director of operations, Fort Indiantown Gap, spoke about the partnership between Lithuania and Pennsylvania. As usual, the food court behind the main stage was filled with people purchasing a wide variety of Lithuanian ethnic food, including cold beet soup (saltibarsciai) , potato pudding (kugelis), meatballs (kotletai/bandukies ), Lithuanian sausage (desros), potato pierogies, stuffed cabbage (balandeliai) , fresh dill pickles (agurkas), sweet sauerkraut salad (saldus rauginti kop?stai salatos) and more. The Zilvinas Dance Group from Philadelphia performed folk dancing at center court at two times. Lynne Cox and Varpelis members (Lithuanian folk group) performed, which included a sing-along. Pop and folk singer Augis, the stage name of Eugenijus "Eugene" Dicevicius, a resident of Cleveland who emigrated from Lithuania nine years ago, performed Saturday and will return today. The Pennsylvania National Guard Band also performed, and campfire songs were sung by the Partisans, Augis, Lynne Cox and Varpelis, and the audience. At 5 p.m., the Lithuanian Elementary Scholarships announcement was made by Karen Domalakes. Two heritage rooms provided a taste of Lithuanian traditions, with this year's theme being, "Food, Folklore and Folk Medicine." A boilo contest was held in The Screening Room, where Lithuanian beer was sold. Today's celebration begins with The Sensations playing at 11:30 a.m., followed by welcome and introductions at 12:15 p.m. There will be a presentation at 12:30 p.m. by the Lithuanian Partisans Living History Group with Argall, followed by the Gintaras Dancers (children dancers) from Mahanoy City at 1 p.m. The Lithuanian ambassador to the United States, Zygimantas Pavilionis, will speak at 1:30 p.m.
At 1:45 p.m., members of the Lithuanian folk group Varpelis will hold a sing-a-long. The Malunis Dance Group will perform at 2:30 and 4 p.m., and the Zilvanis Dance Group will perform at 3:30 p.m. The Sensations will perform at 4:30 p.m., followed at 5 p.m. by drawing of prizes, results of the boilo tasting contest and closing ceremonies. The Lithuanian Days celebration was started in 1914 by the Lithuanian Catholic Priests League at Lakewood and Lakeside parks to bring together Lithuanian immigrants and their families for a day of culture, fun and good fellowship. Until the end of World War II, it was always held at the parks on Aug. 15, which is the Solemnity of the Assumption of the Blessed Virgin Mary, a holy day of obligation for Catholics. Many coal mines closed for the day so the people could go to Lithuanian Day. After World War II, it was held on the Sunday closest to Aug. 15 to accommodate the young people who left the area for better jobs. As many as 25,000 people attended the festivities. Many prominent people attended and there was always a morning Mass followed by a program in the afternoon. It was held at Lakewood Park until the park closed, and then moved to Rocky Glen Park until that closed. Since then, the Schuylkill Mall has allowed the event to be held there. All proceeds have been used for Lithuanian causes since 1914. In early years, it aided the Lithuanian religious orders in the United States. After World War II, it aided Lithuanian displaced persons in the DP camps in Germany and helped many to immigrate to the United States. During the occupation of Lithuania by the Soviet Union, it helped the underground in Lithuania and since independence, has aided with medical supplies, books and educational supplies to the poorest schools. Aid also went for orphan care and hospice, and to the elderly poor, many of whom returned from Siberia and have no incomes.